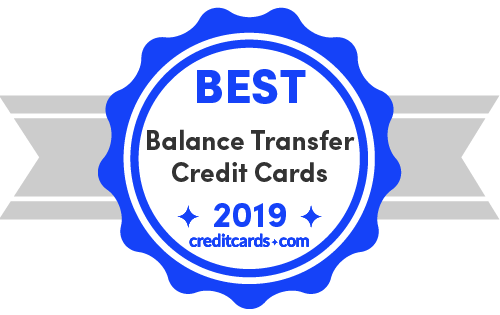 The best balance transfer credit card is the Wells Fargo Platinum Visa card due to its lengthy 0% intro APR offer of 18 months (then 13.74% - 27.24% variable). The Discover it Balance Transfer is another balance transfer card that can help you save money with its interest-free period of 18 months for balance transfers and low regular APR of 14.24% - 25.24% variable. Analysis: This card has the unusual feature of 0% APR for 18 months on both purchases and qualifying balance transfers. The regular APR weighs in at 13.74% - 27.24% variable, so you'll want to pay off your balance before 18 months end. Also keep in mind that you must make your balance transfers within 120 days in order to qualify for intro rates and fees. During the first 120 days, the balance transfer fee is a lower 3%, but goes up to 5% after that. You can also get up to $600 protection on your cellphone (with a $25 deductible) for covered damage and theft when you pay your cell bill with this card. Bottom line: This card an unusually long 0% intro APR offer; just make sure you are aware of the caveats and pay off your balance before the regular APR kicks in. Analysis: The Discover it Balance Transfer gives you an excellent 18-month 0% intro APR on balance transfers (14.24% - 25.24% variable APR), as well as 5% back on select rotating categories up to the quarterly max each time you activate, and cash back match at the end of your first year. It's important to stay on top of any new purchases so you don't carry a balance that incurs interest charges. As long as you pay down at least the balance of the new purchases after the first 6 months and before 18 months, you won't incur interest, and you'll fully benefit from the cash back. So, if you spend $500 a month on select categories, you can earn $600 – $75 a quarter for your purchases plus $300 at year end. Analysis: The Barclaycard Ring Mastercard comes with a few distinguishing features in addition to having no annual fee and no foreign transaction fees. Namely, there are no balance transfer fees for balance transfers with a non-promotional APR after the first 45 days of account opening, while the fee is 2% (or $5, whichever is greater) during those first 45 days. Unfortunately, cardholders are forced to choose between the 0 balance transfer fee offer and the 0% intro APR offer, as the latter works the other way around. If you make your balance transfer within the first 45 days, you'll have 0% intro APR for 15 months (then 14.24% variable afterwards), but if you do it after 45 days, you're looking at 14.24% variable APR right off the bat. Bottom line: While the Ring is one of the few credit cards that offer no balance transfer fee, it's set up in a catch-22 of sorts, so most consumers may prefer the Amex EveryDay® Card from American Express* instead.